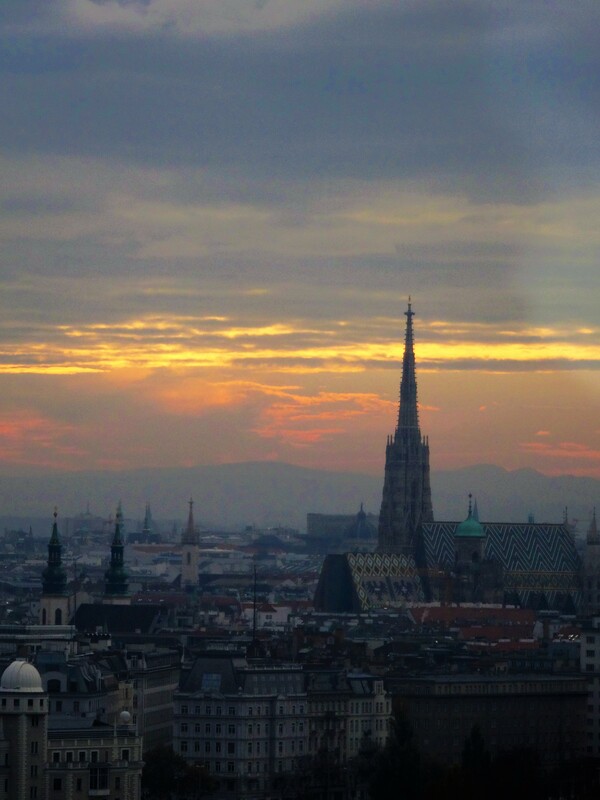 I arrived in Vienna – or Wein – during sunset. Arriving in any foreign city during sunset always leaves a bit of an impression. A bustling city with vibrant nightlife, gorgeous architectural designs, cozy coffee houses and dining that supports a progressive lifestyle. 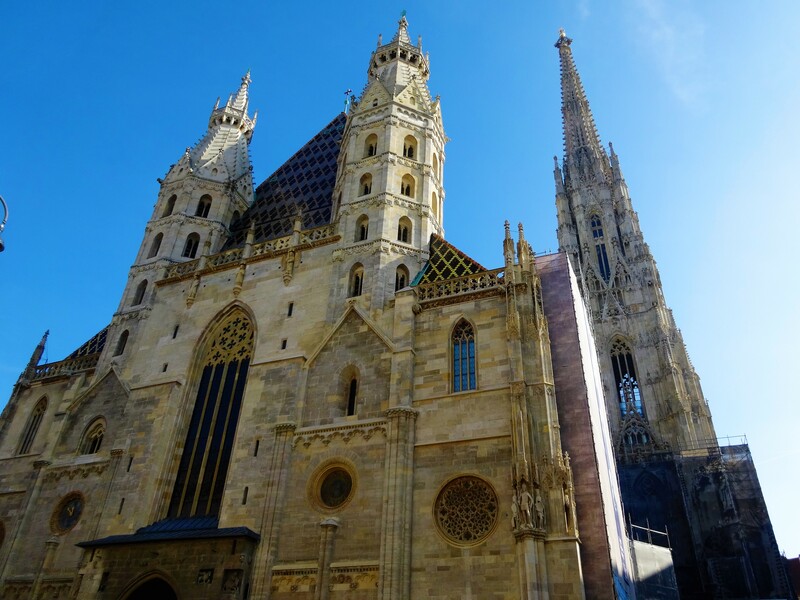 With rich history, culture and tradition, Vienna is a well deserving contender for any time spent away from home on holiday. Perhaps one of it’s most well known attractions is Stephansplatz, or St. Stephan’s Square. It’s here where you can find the cathedral of St. Stephan. Beautiful from the outside and surrounded by several shops and cafe’s, you could easily spend a few hours here. Although it is a bit pricey to enter the cathedral (somewhere around 18 USD to date), and this may be a strong deterrent for some. If so, check out the Peterskirche, or St. Peter’s Church just a few minutes walk away. As admission is free, and it offers very beautiful architecture and history as well! Not far from Stephansplatz in Vienna’s old town, you can find Mozarthaus, Mozarts only surviving Viennese residence which is now a museum. Admission is roughly 13 USD and includes an audioguide. This is a fantastic way to learn a bit more about Vienna’s history and culture, as well as Mozart’s quite impressive but short lived life – as he died at the age of 35. As we all well know, Vienna is home to many greats such as Beethoven, Sigmund Freud, and Mozart. 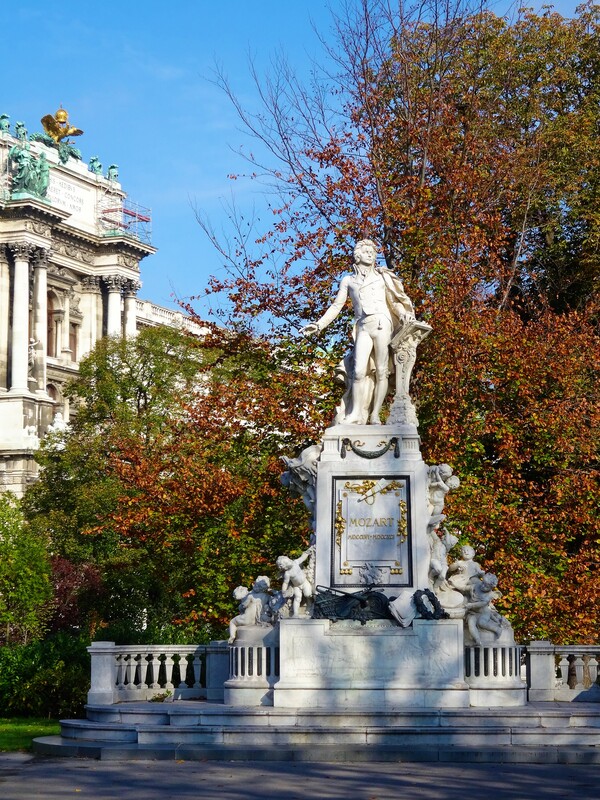 The City Centre is home to one of the most famous statues of Mozart in the world. 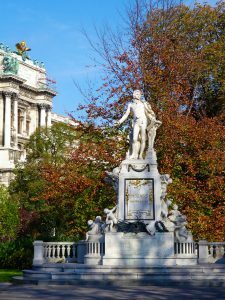 Situated in the middle of the Imperial Palace Gardens, or Burggarten, sits a towering statue of Mozart with freshly planted flowers forming a treble clef in the lawn. I happened to be able to snap this shot after waiting about 15 minutes for the crowds to migrate. Gobs of tourists gather here for photo-ops, picnics, and casual strolls through the park. 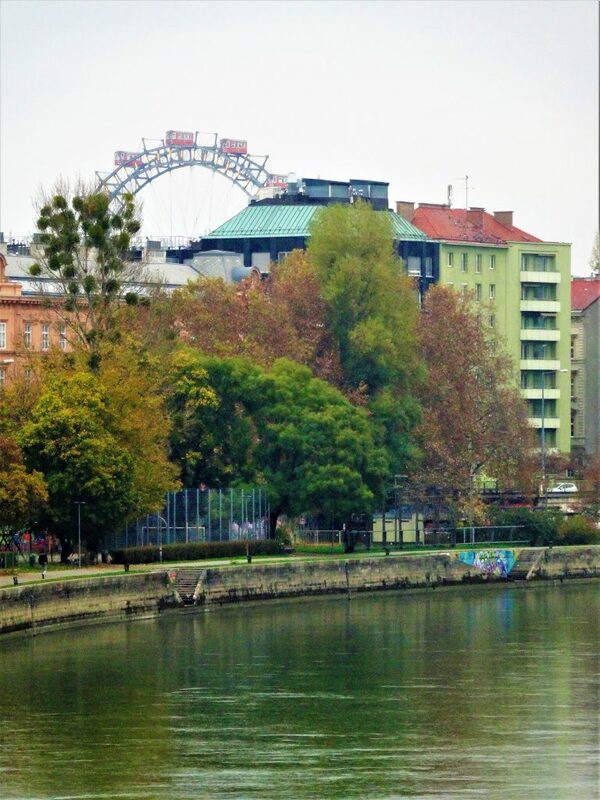 Check out Weiner Reisenrad – the massive iconic ferris wheel located on the Danube river. Upon entering Take in a full 360 panorama of the city from 200 feet up, and get some great photo’s while you’re at it! Admission is roughly 12 USD per adult to ride the Weiner Reisenrad. 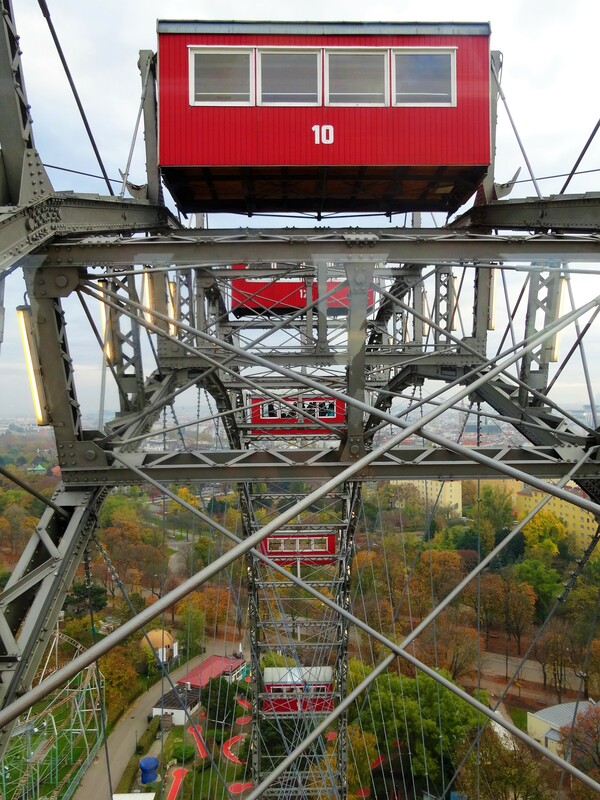 However, there are also combination tickets that include the Schonbrunn Zoo, Liliput Railway, Danube Tower, Madame Tussaude Wax Museum, and the Prater Amusement Park. You can check out their website here for the latest prices and discounts. 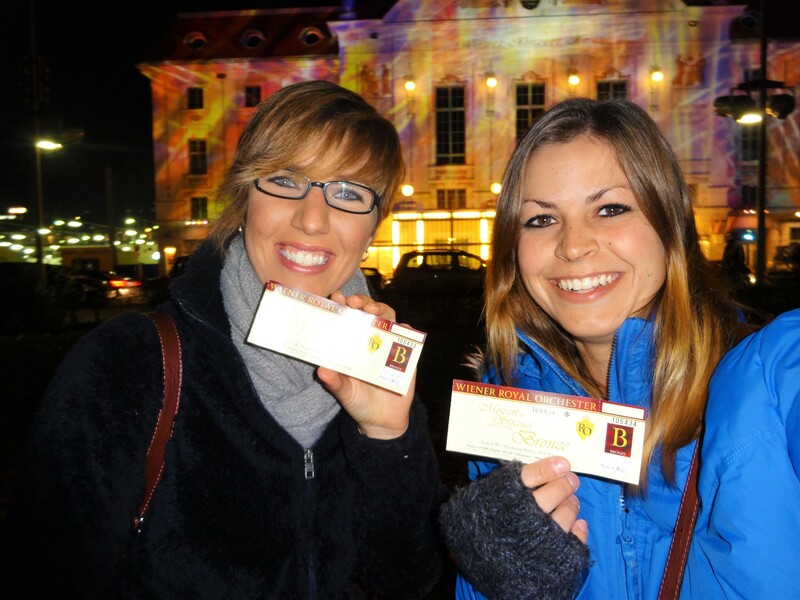 As Vienna has a rich classical history, what better place to go to an opera house? There are several places to see the opera, depending on how much time you have and how much money you’re willing to spend. There are always people selling tickets in front of and around St. Stephans Cathedral. Hang out long enough and you’ll be approached. Choosing where you want to go, what you want to see, and how classy you want the place to be is much like a la carte. From the cheapest to the most expensive, the hole in the wall to the most extravagant, you’re bound to find something that suits your taste! Fun Fact: Just in case you’re a collector of snow globes (hey, no judgement! I used to collect ridiculous things and you can read about that here), you’ll be intrigued to know that the snow globe was invented in Vienna back in 1900 by a man named Erwin Perzy. You can still visit the original store, as stated in it’s name, Original Vienna Snow Globes on Schumanngasse 87. It’s about an hour walk from Stephansplatz, so you may want to jump the bus for this attraction. I stayed at my first Wombats hostel (what’s a hostel? Learn here!) in Vienna, the Wombats at Naschmarkt. 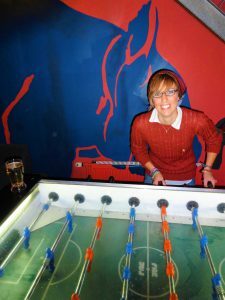 It was an excellent time, complete with a bar, foosball and pool tables, an open-air rooftop hang out space, a group of 15 boisterous Aussie football players, and free beer vouchers! 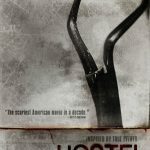 Hostelworld is one of the main search engines I use while checking around for the cheapest and best rated hostels. A make-it-or-break-it deal for me is free breakfast. It’s worth shopping around for a place that includes this! The Naschmarkt is a must-see while you’re in Vienna. A gorgeous few blocks of fresh produce, olives and spices, exotic fruits, seafood, meats and sweets. 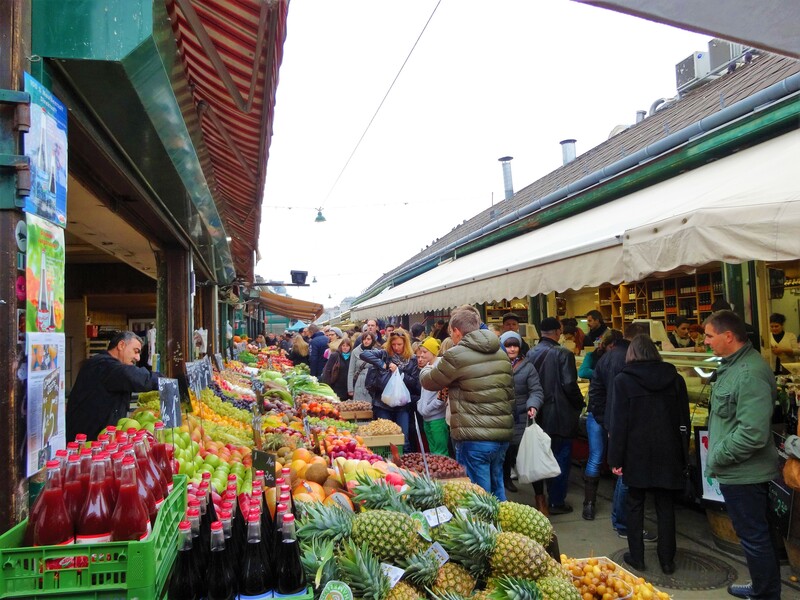 Early morning is the best time to visit this market, as the afternoon brings larger crowds. Keep in mind that this is a place where locals thrive off of the tourism industry, the entrance to the market is a bit of a tourist trap with vendors being a bit more aggressive than the mid-to-end section. Also, there are things I’ll pay a bit more for, however water isn’t one of them. I’d suggest to bring a bottle or two with you, as you can purchase five or six bottles elsewhere for the price of one at Naschmarkt. About a twenty minute walk north of Naschmarkt you’ll find Judenplatz. Back in the middle ages this town square was the center of Jewish life. Established in the 1100’s, meeting turmoil in the 1400’s, and of course the most well known and recent Holocaust in the early 1940’s. 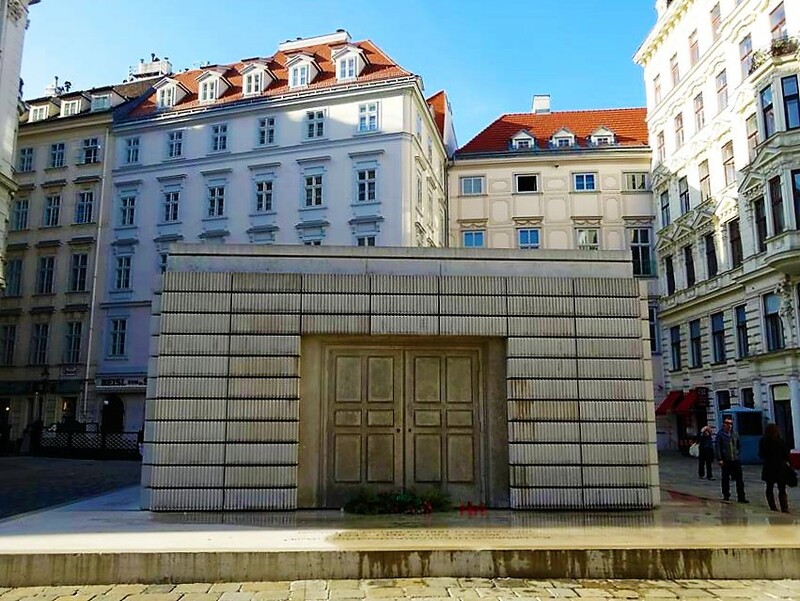 Here you will find the Jewish Museum, the Lessing monument, and the Holocaust Memorial in remembrance of the 65,000 Austrian Jewish lives lost during the Holocaust. The Holocaust Memorial is a 33ft long by 23ft wide block in the middle of the Judenplatz square. It rises 13 feet high and definitely commands your attention. The memorial itself resembles a library, all of it’s books turned with the pages out and the spines hidden in the concrete block. Representative of the thousands of nameless Jewish lives lost. 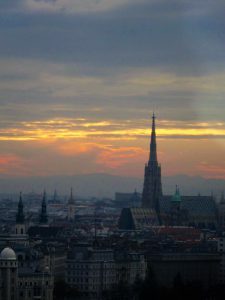 Vienna grows and progresses with the times, a melting pot of sorts. In it’s old town and city centre it still clings to and displays it’s deep rooted history with a wide variety of building cultures. Here a tasteful blend of adoration for classical music, wine taverns, and cafes and shops full of traditional Viennese cuisine can be found. 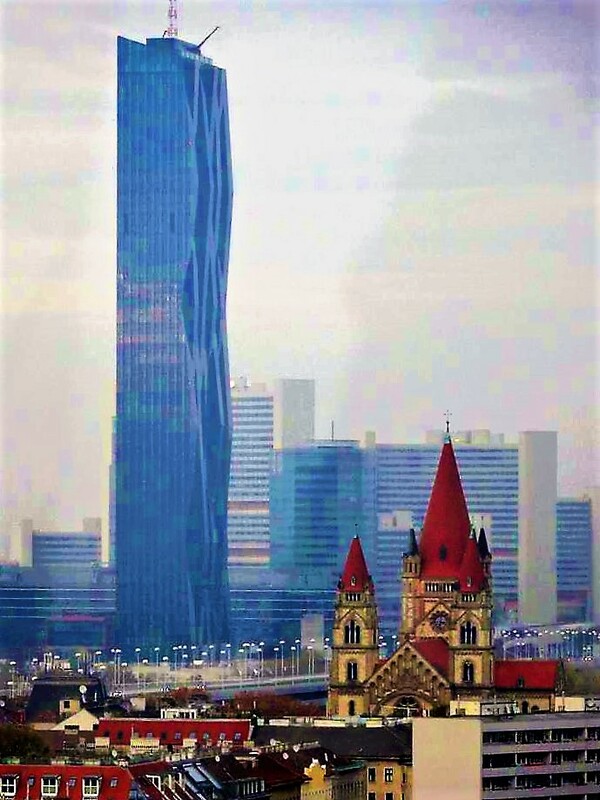 Vienna is a beautiful example of the coexistence of both historical and contemporary buildings, where modernity and tradition remain side-by-side. 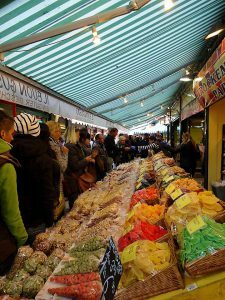 After checking out the sights in Vienna, head over to it’s equally culturally rich sister city of Salzburg! Read about Salzburg and Werfen here! Been here? Headed here? I’d love to hear from you! Leave a comment, I reply to them all! 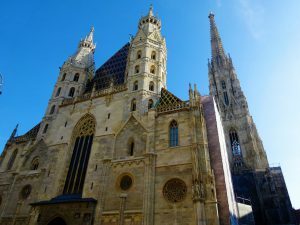 Most Europeans vacation in Vienna during the warm, sunny weather – generally between June and August, so the best time to go (in my opinion) is when the crowds aren’t so crazy – primarily during Spring and Fall. My favorite European country (out of the ones I’ve visited thus far) is probably Switzerland. You can check out my post on Interlaken here if ya wish! I also have one on Lucerne and Mt. Titlis. Hey Steve! In Salzburg specifically I used hostels, but I just did a search on AirB&B and Couchsurfing and it looks like with a little planning you won’t have a problem at all! Although it does depend on your filters 🙂 Happy Travels and thanks for stopping by! Thank you for this nice article. I always wanted to visit Vienna. It is definitely a breath-taking place. I would definitely pay those amounts to see those sights. I think it is worth it in the end. How long do you think one would have to stay in order to visit/go to all the memorable and worthwhile spots there? I would love to make the most out of my trip! If you want to see the opera and can plan accordingly, two or three days would suffice! It is a beautiful city with a fabulous ambiance! The opera was amazing! It was the first I’d ever been to! As for finding like-minded people in hostels – absolutely! I’ve also met other travelers and became travel buddies while staying in hostel dorms! I loved Thailand, Vietnam however was more of an acquired taste for me. Thanks so much for reading!